Mobile apps have been true revolution of current generation. According to firm Statista, the number of smartphone users is forecasted to go up to 2.5 billion in 2019. This is huge number. Also it is important to note that users do not use these devices merely for entertainment and gaming purpose, business and enterprise apps are equally popular among smartphone users. In this smartphone empowered world, a mobile application is the thing that a business requires, for its working environments and its employees. Mobile applications for enterprise can help organisations in boosting employees’ productivity to the optimal level and use resources in the most efficient way. Employees, in this digital era and technological driven workplace, possess at least 3 gadgets in a day. The world has gone technology savvy, which has a great effect on workplaces. The facility of mobile devices allow employees to work even if they are not sitting at their work station. 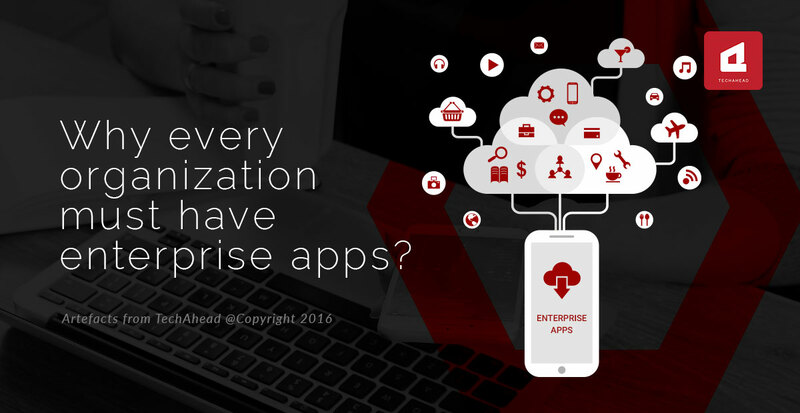 Let us go through the advantages of enterprise apps for organizations. No worries if employees offline or far from the reach of internet connectivity, they can still have the access to corporate data through enterprise apps. The enterprise mobile app maintains a backup of data and serves users as and when required, even when offline. It accumulates the data in the cloud. Hence, not a single corporate data ever gets mishandled or lost. Although collaboration is at the heart of the modern business processes, organizations are still in the dark about to manage it. With an enterprise mobile app they would have one secure area for all content, notifications, deadlines to enable faster, more informed decision making. The thumb rule to succeed in any business is ‘keep your employees happy’. Allowing employees to work as per their convenience and hence fosters optimum work performance. It ensures that employees work smartly and faster. This leads to increased productivity, thereby profiting the business as a whole. Out of many techniques and strategies to improve employee productivity, this has proven to be the best until now. Clients are very judgemental and choosy when it comes to doing business with companies. They do not prefer to join hands with the ones that lag behind technologically. This may create a negative impression of a company in their minds. Client may think of a technologically lagging company as not capable enough to deliver satisfying results. Dissemination of information and data as per the designation and roles of the employees is one best feature of an enterprise mobile app. The employee’s gadgets must be designed to receive secured information and business applications according to his/her profile and responsibility, or project assignment in the enterprise. The above are just few of many advantages of having an enterprise application and we believe that every businesses should look at investing in getting one. At TechAhead we have created many enterprise applications for businesses of all sizes, we can create one for you as well. Contact us today, asking for a quote is free. Mobile applications for enterprise can help organisations in boosting employees’ productivity to the optimal level and use resources in the most efficient way.